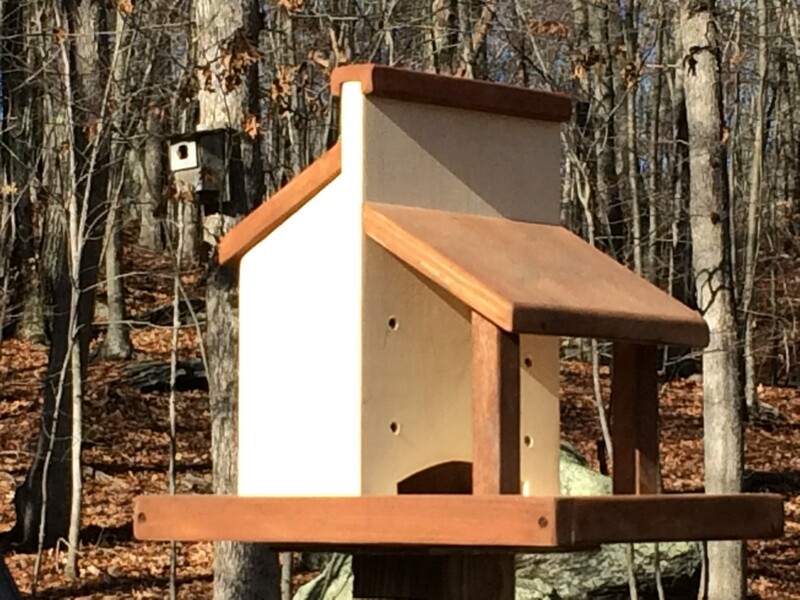 Platform feeders attract a large variety of birds, including many types of birds such as cardinals who will not approach a traditional tube feeder. Fill the bin with the seeds, and the birds will come! The Country Store Bird Feeder is designed to resemble a rustic building from the Old West. The country store motif adds a bit of whimsy to a basic platform feeder, without sacrificing functionality. The fly-through design that allows birds to approach the feeder from multiple directions, and the covered bin protects the seed from the rain and snow. The porch roof helps to keep the seed dry, and the feeder tray has drainage holes in the corners. 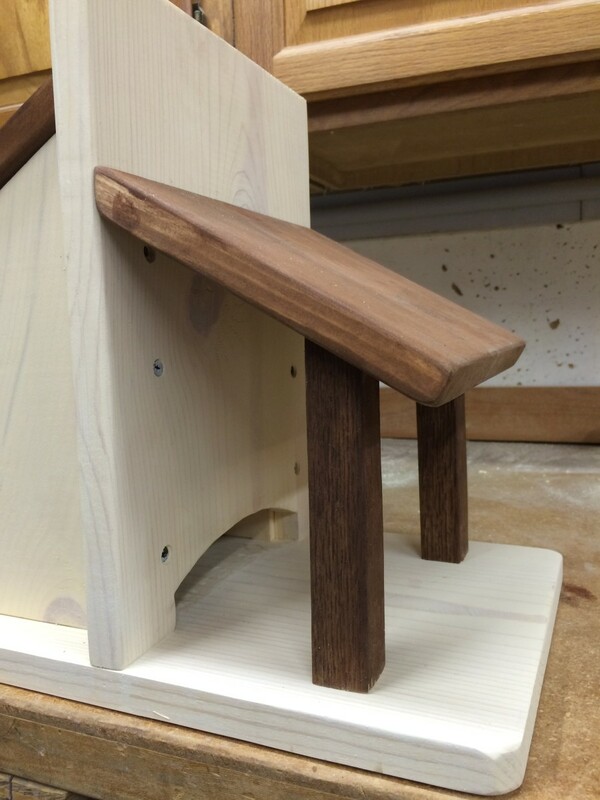 The feeder is finished with a few simple trim pieces and colored stains to add character to the design. The Country Store Bird Feeder is made from inexpensive pine along with a few other leftover pieces of wood from my scrap bin. Pine works well for this project and will last for several seasons, especially when the exterior is painted or stained. 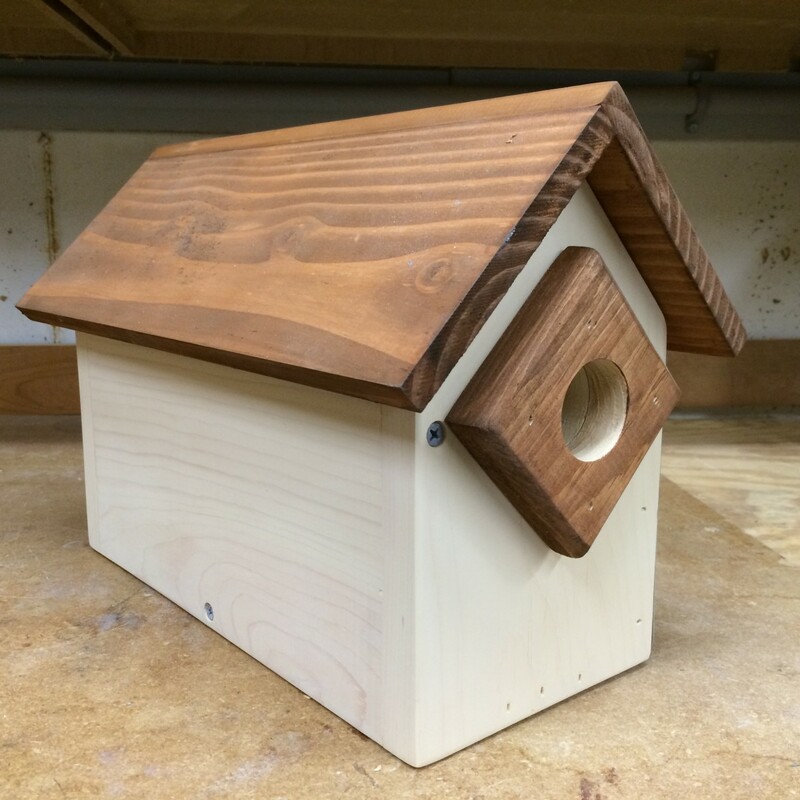 Cedar, redwood, certain hardwoods or pieces of salvaged lumber are also good choices for birdhouses and feeders. Hardwoods such as mahogany and teak are naturally resistant to insects and weather, and tend to last longer when exposed to the elements. 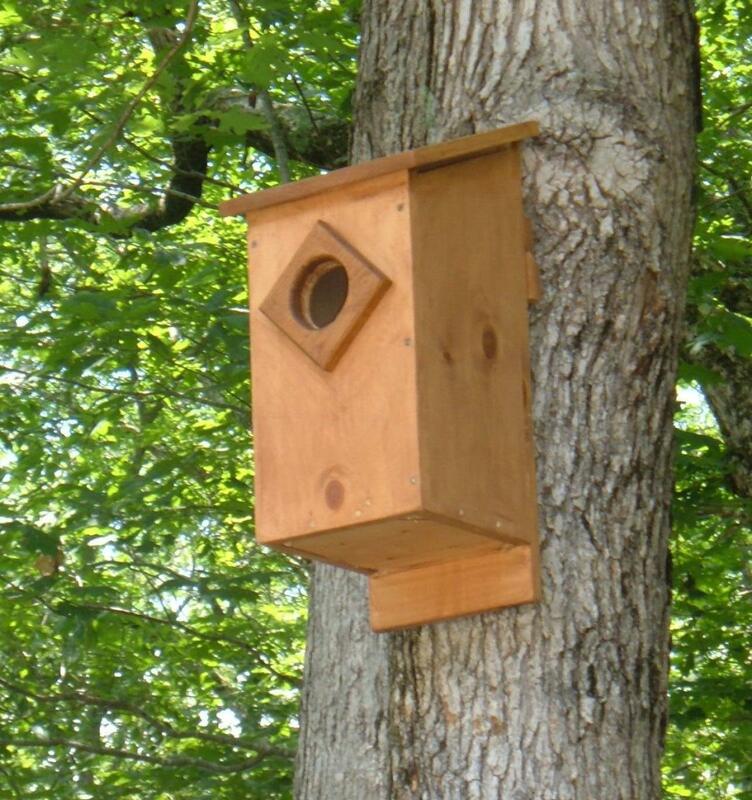 Avoid using any pressure treated lumber; the chemicals used to ward of the bugs are potentially harmful to the birds. 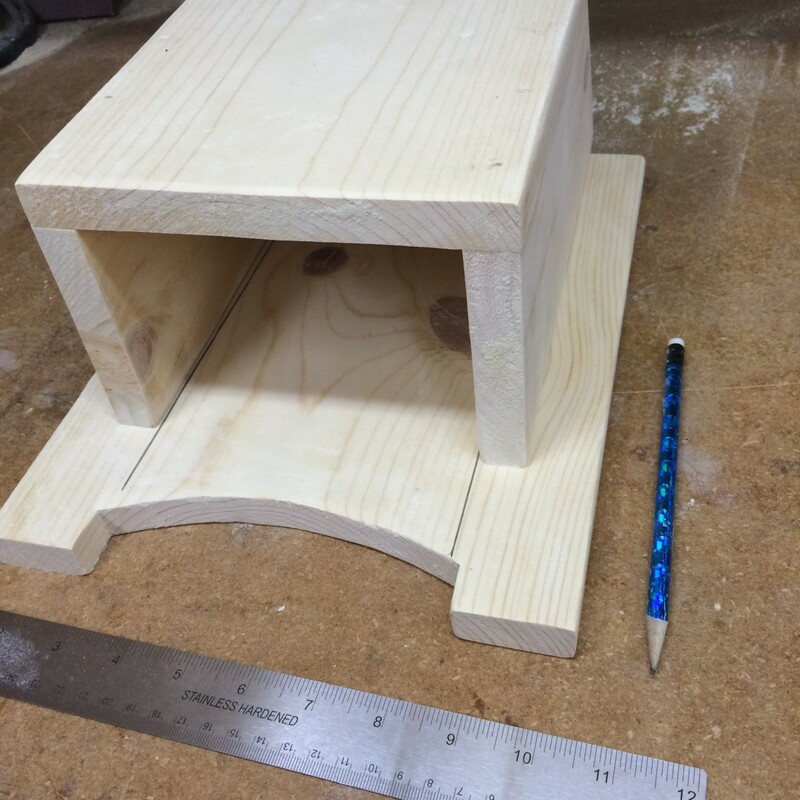 The size of the feeder is not critical, and you can adjust the dimensions as needed. 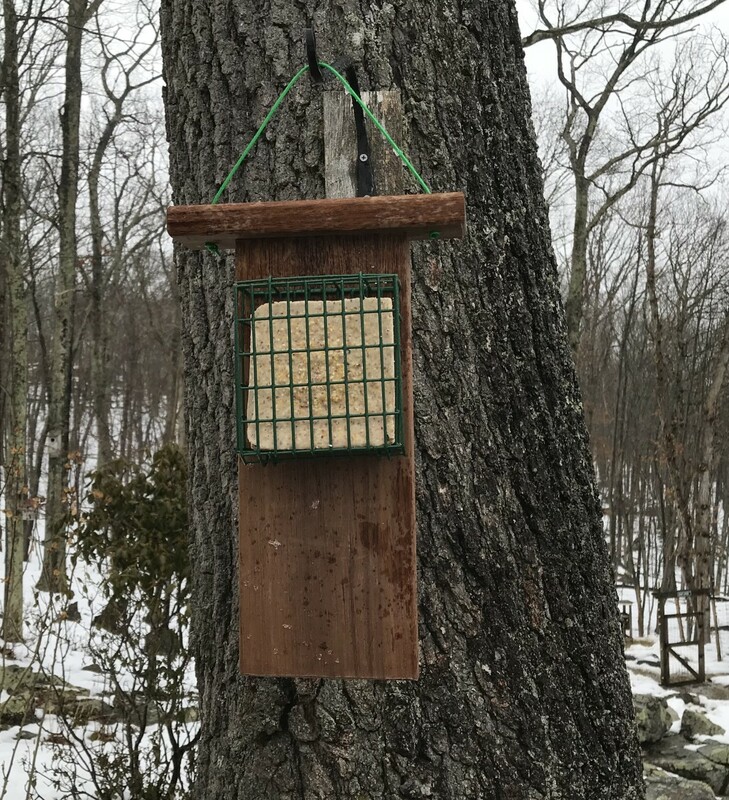 I used a standard 1x10 pine board from the local home center for the base of the feeder, which is actually 9-1/4" wide. 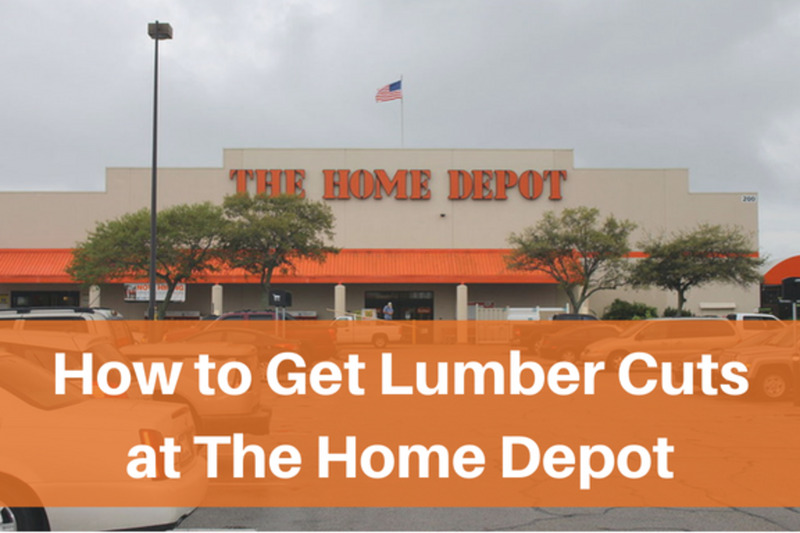 Look for pieces of lumber that are flat (not warped or cupped) and free of large knots. I spent about $10 for the wood in this project. 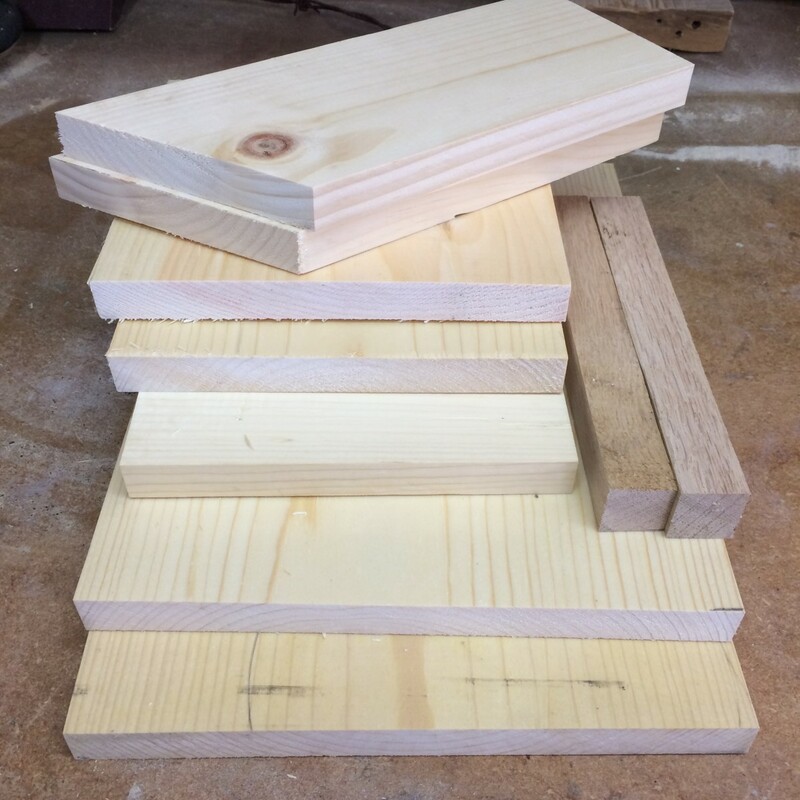 Porch Posts (qty = 2): 7" L x 3/4" x 3/4"
The Bin Sides, the ends of the Bin Roof and Porch Roof and the tops of the Porch posts are all cut on a 30-degree angle. Rough-cut the porch posts a little long; we will adjust the final length of the posts later for an exact fit to support the roof. The bottom of the High Wall has a small opening that allows the bird seed to flow out of the bin and into the feeder tray. The slot is shown in the photo and is about 5-1/2" long, and centered along the bottom edge of the high wall. The top of the arched slot is 1-1/2" high at the peak, and tampers to 3/4" high at the ends. Cut the slot using a band saw or jig saw, and then sand the edges smooth. The Ridge Cap sits on top of the high wall. Though mostly decorative, the ridge cap helps to protect the end grain of the high wall against the elements. Center and cut a 1/4" deep by 3/4" wide groove (called a dado) along the length the ridge cap. The ridge cap should fit snugly on the top end of the highball. I used a piece of mahogany for a bit of contrast, sanded and finished with cherry stain. The corners of the base are cut on a 45-degree angle to allow rainwater to drain out of the feeder tray. A few 1/4" diameter holes drilled through the base will work, but I prefer to clip off the corners. 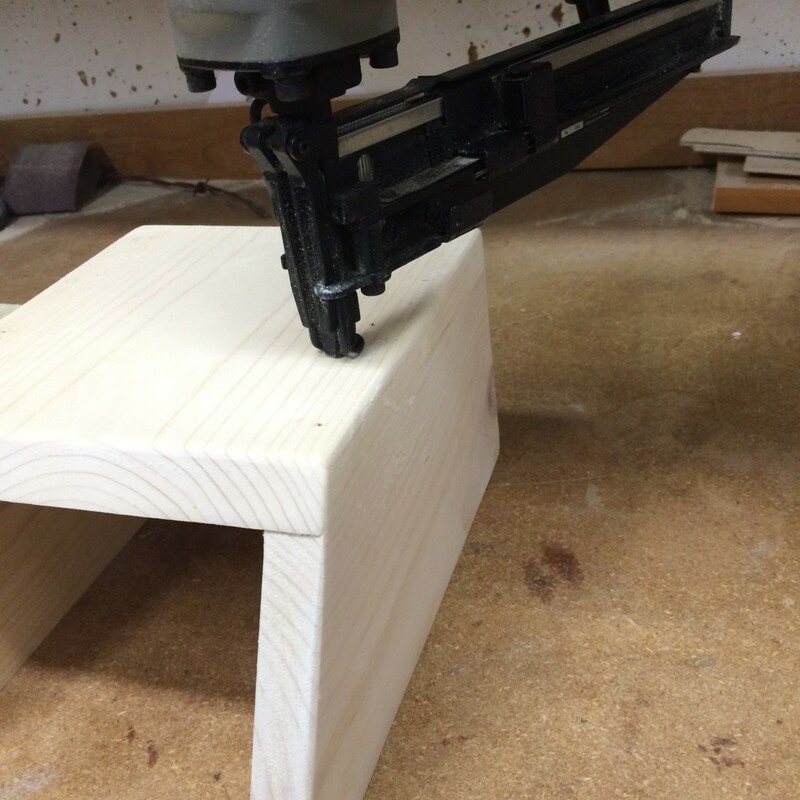 A power miter saw makes cutting off 1/4" from each of the corners quick and easy. 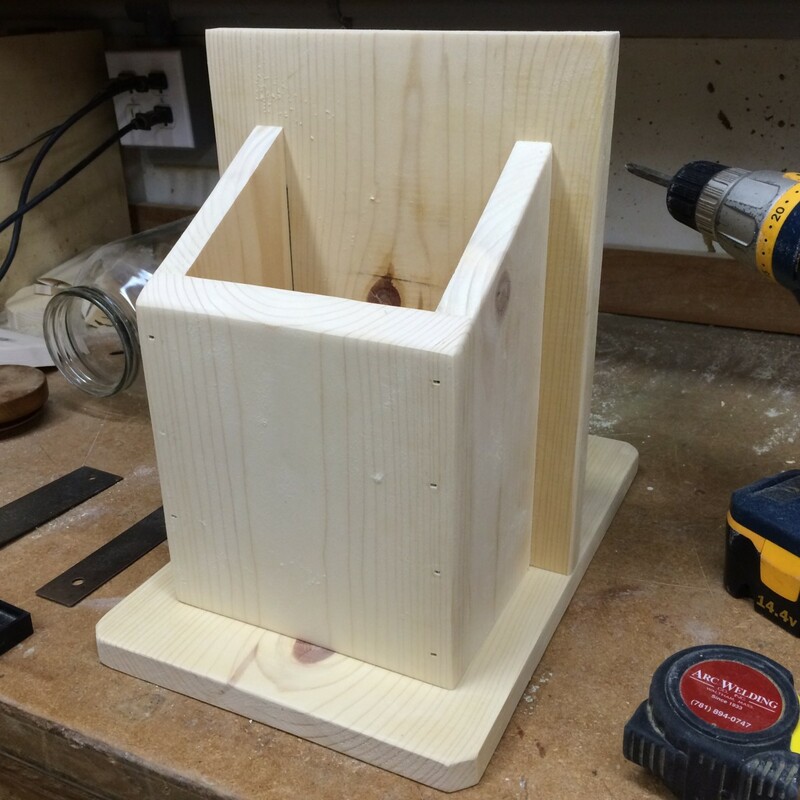 The trim around the base of the feeder were cut from 1-1/4" wide pieces of pine. Measure across the end of the base, and cut the end pieces to fit. Then measure the side pieces - including the additional thickness of the end pieces, and cut the sides to fit. 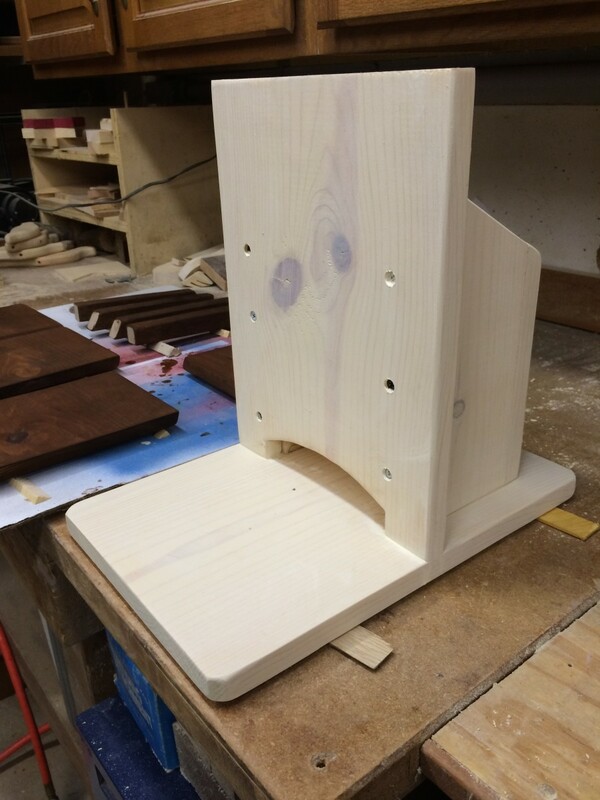 I added the trim pieces at the end of the project, after the pieces were fitted and sanded and then stained. The country store design might look complicated, but the construction is relatively easy when broken down into subassemblies. Begin by assembling the bin, and start by attaching the front section to one of the side pieces. Line up the bottom edges of both pieces, and secure with weather-resistant nails or screws. A bead of water-resistant glue helps to holding power of the pneumatic nails. Then, attach the other side section of the bin with more glue and nails or screws. Next, attach the bin to the High Wall section using more nails or screws. Temporarily position the bin against the high wall, centering the bin on the back section. Use a pencil to trace a line along the inside edge of the wall, following the sides of the bin. This will make it easier to locate the nails for attaching the the wall to the bin. Using the pencil lines as a guide, drill pilot holes for the screws. 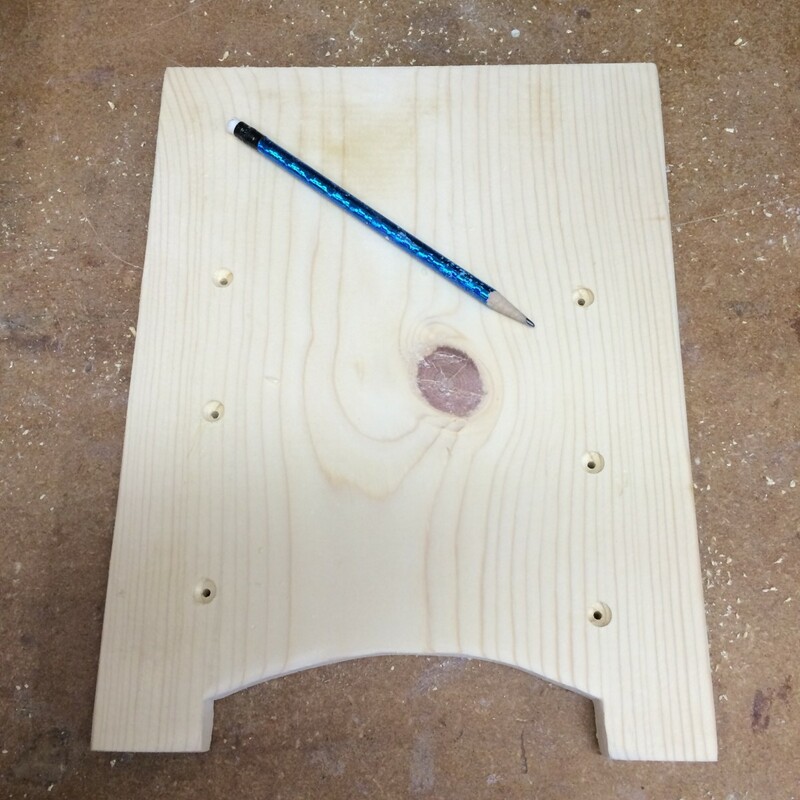 Use care to locate the pilot holes 3/8" from the pencil line, so the screws will be centered in the sides of the bin. Attach the high wall to the bin. Next, position the bin assembly on to the base. Using the same tracing procedure, mark the locations of the high wall and the bin pieces on to the base, and then drill more pilot holes. Attach the bin assembly to the base with more screws. If you want to stain your feeder, now is the time to sand all of the remaining pieces to round over the edges and smooth the joints. 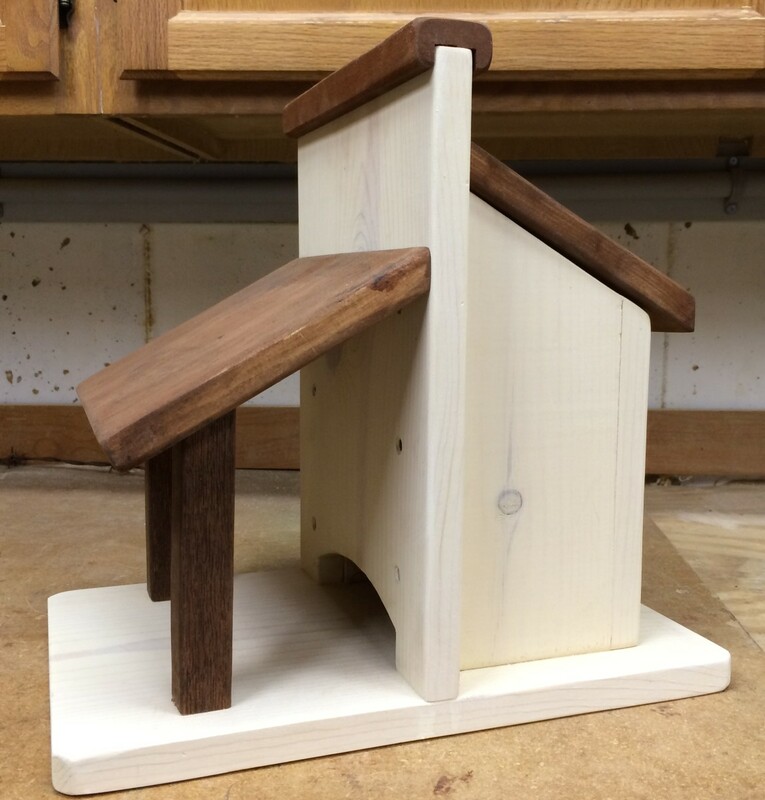 Breaking the sharp corners gives the bird feeder a finished look, and allows the paint and stain to adhere better. Sanding and the staining the pieces of the feeder is easier at this stage of assembly, rather than trying to apply different colors of stain after the feeder is fully assembled. 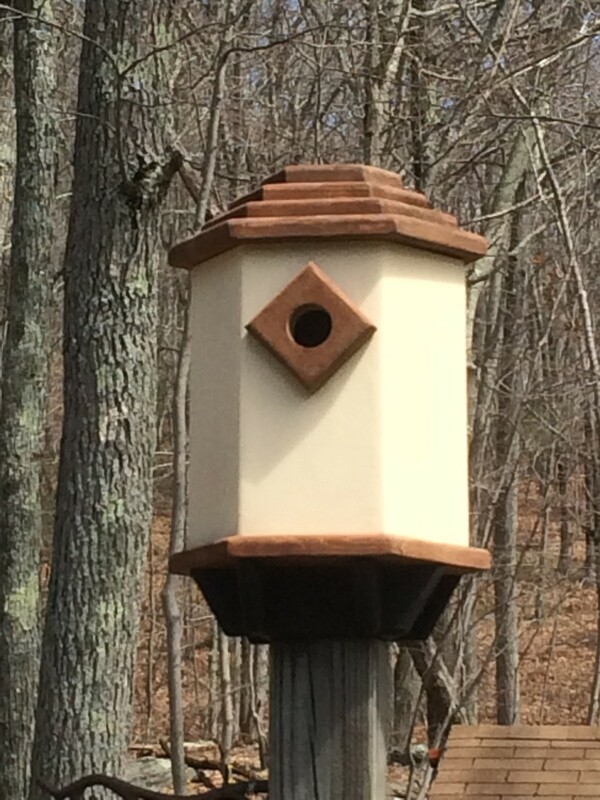 Three different colors of stain adds a rustic charm to the Country Feeder. The stain also helps to protect the pine from the elements, and will extend the life of the feeder. I used a stain called "willow" to whitewash the bin and base; I did not stain the interior of the bin where the birdseed is stored. The bin roof, porch roof and the porch posts are stained walnut brown. 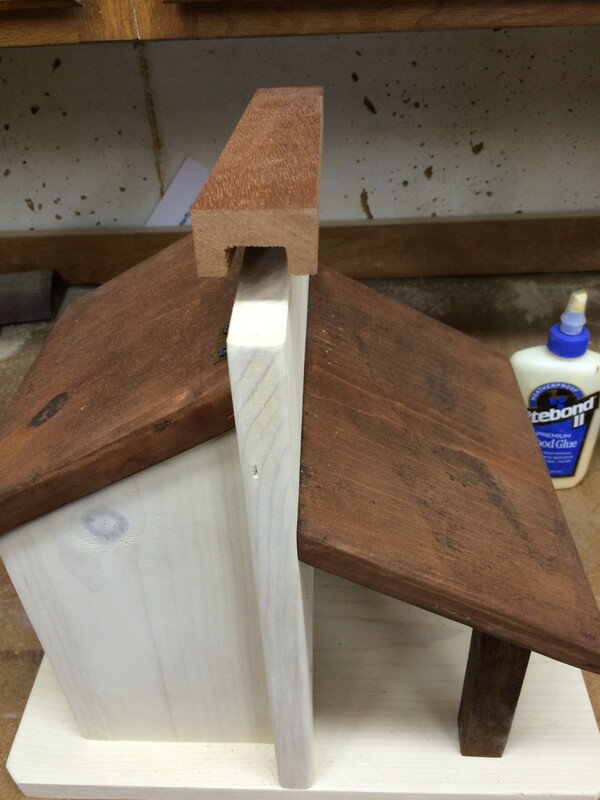 The ridge cap is stained cherry to accentuate the reddish color of the mahogany. 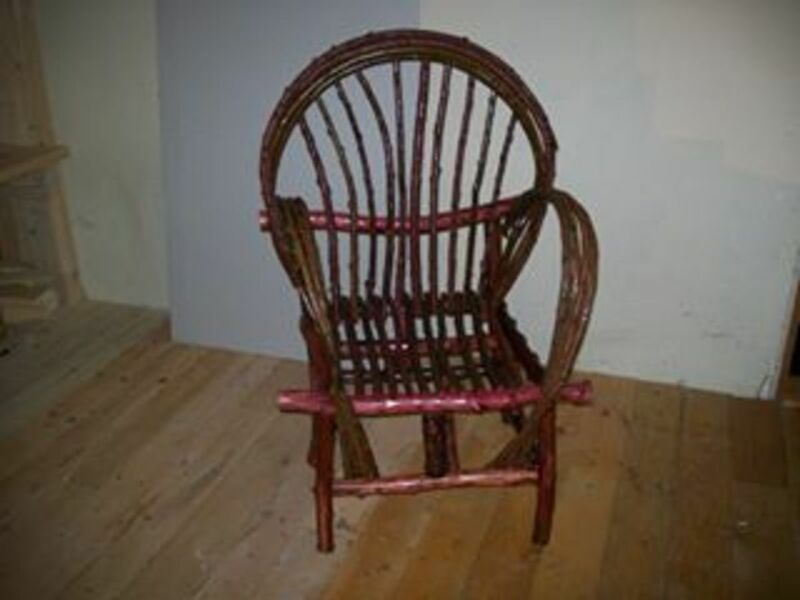 The stained pieces were left overnight to dry thoroughly before beginning the final assembly. Attaching the porch is the hardest part of the feeder build, but it's the porch that gives the County Store bird feeder its country charm. The porch roof also helps to keep the birdseed dry and protected from the rain and snow. The porch roof is attached to the high wall using screws. Because the roof slopes at a 30-degree angle, the screws must be driven into the roof at the same 30-degree angle. Start by locating the position of the roof against the high wall, 7-1/2" up from the base. Using the same procedures for attaching the bin to the base, mark the locations for the pilot holes. This time, take care to angle the drill at the same 45-degree angle as the roof line. Attach the porch roof to the high wall. The porch posts were cut long initially to make it easier to mark and cut the posts to the correct length after the porch roof is installed. The posts are located approximately 1-1/2" in from the front edge of the porch roof, and 1" in from the side edges. Temporarily line up the top end of the post (with the 30-degree cut) under the porch roof, and mark where the post meets the base. Cut the posts to length. Now, position the posts back under the porch roof and mark the post locations on the base for drilling the pilot holes. Since the porch roof is now in the way of drilling, unscrew and remove the porch roof. 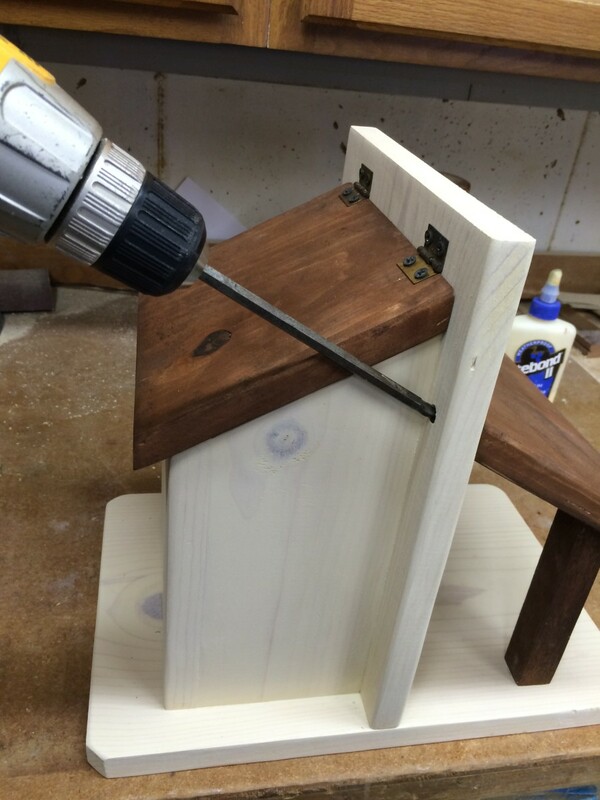 Drill the pilot holes for the posts, and attach each one with a screw drive up from the underside of the base. Then, re-attach the porch roof. The front of the porch roof simply rests on the posts. If needed, you can attach the roof to the posts with a nail or screw. 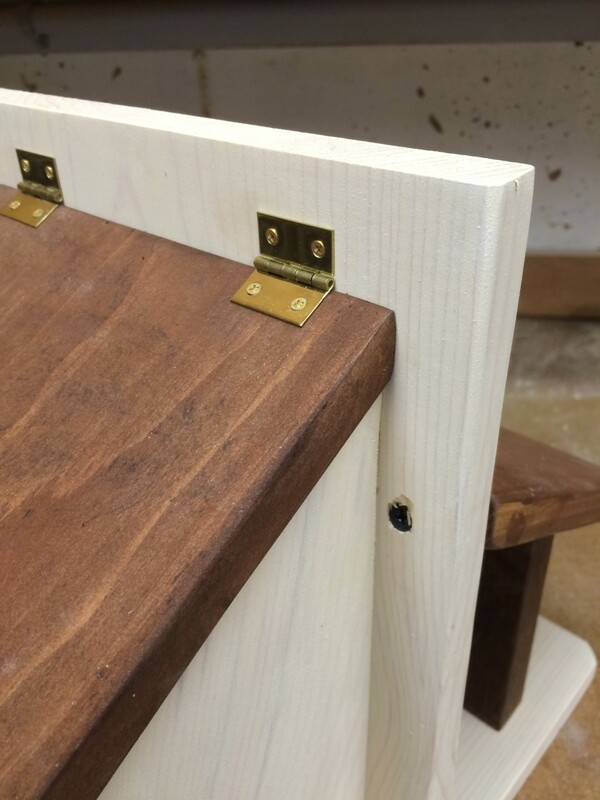 Attach the trim around the edges of the base using nails or screws. The Bin Roof is attached using a pair of hinges, forming a lid for the bin. The small hinges make it easy to fill the hopper with birdseed. Center the roof on the bin, making sure that the overhang is even on each side. Attach one side of the hinge to the roof, then attach the other side of the hinge to the high wall. Attach the Ridge Cap to the top of the high wall with a few nails. The new platform bird feeder is now ready to feed the hungry birds in yard. 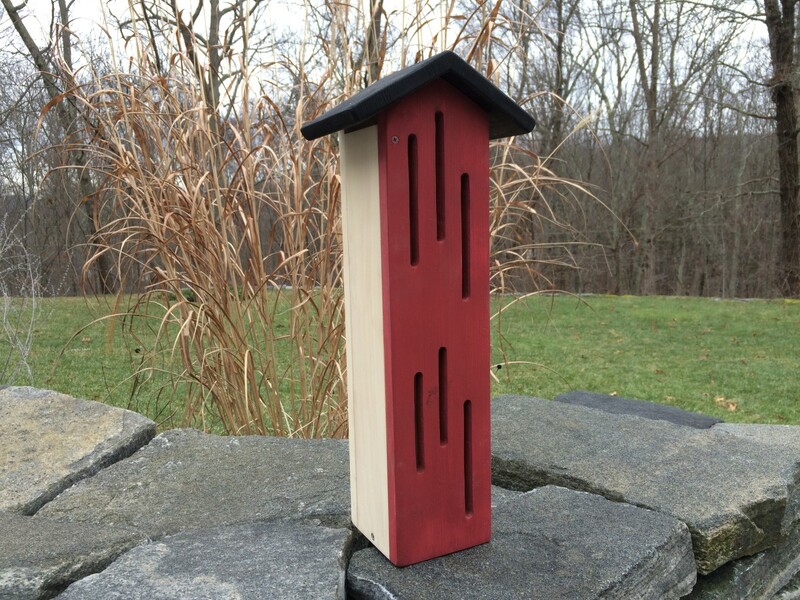 Attach the feeder to a post, fill with bird seed (we use black oil sunflower seeds) and the birds will come. The Country Store Bird Feeder was open for just a few hours before several chickadees, titmice, a nuthatch and a downy woodpecker all stopped by to pick up some seed. 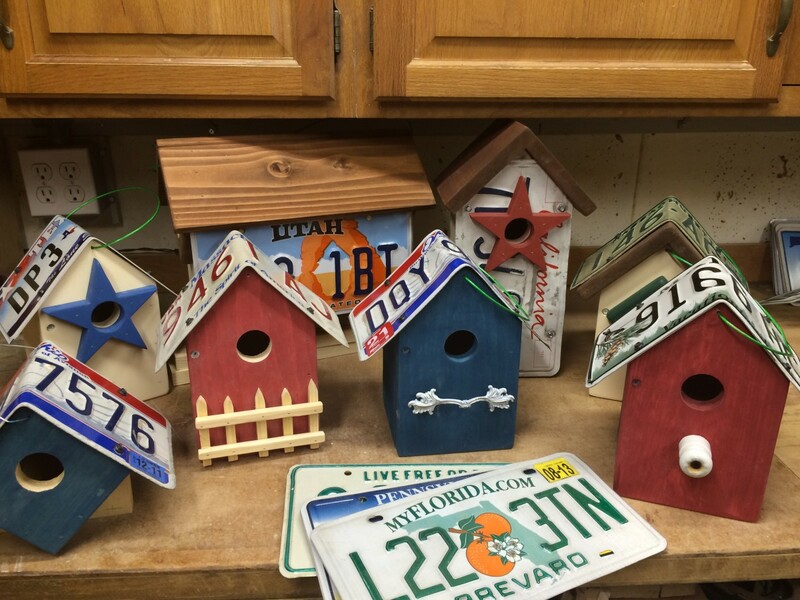 Do you feed the birds, and do you have bird feeders in your yard? That is so neat! I definitely love it. I wish I was more of a carpenter, but I am not. People who can wirk with wood and build things are so very fortunate! This looks so nice and I am sure the birds would enjoy this luxury. I do feed birds everyday but had never thought about doing it this way. Well explained and illustrated hub. Thanks for sharing your useful idea and project! Thanks for stopping by! Squirrels are a problem with platform and tray feeders, and I just accept that they will eat some of the birdseed. A baffle around the pole helps to keep them off the feeder. 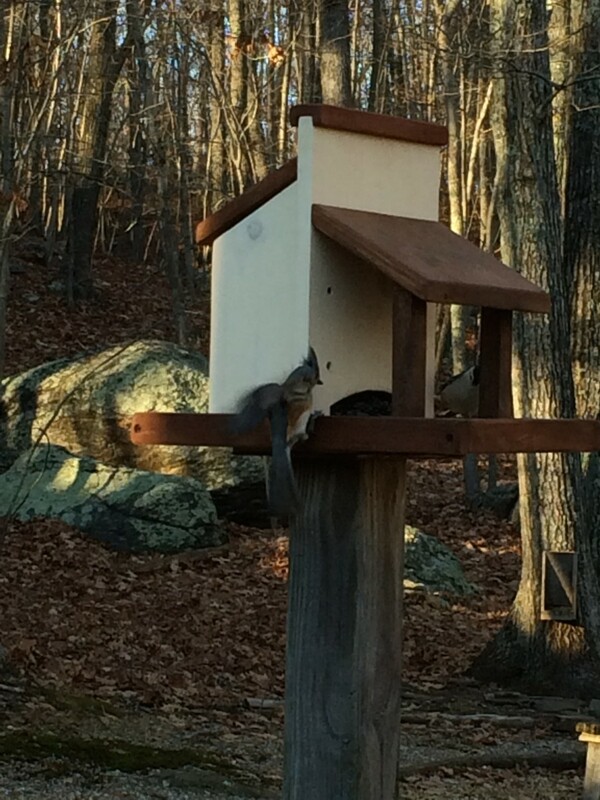 The squirrels are also daily visitors to our deer feeder box, which you can see in the background of the last photo. They even knocked the lid off! This is a really cute feeder and your directions and photos are very easy to understand. I think our squirrel would make an all day buffet at this feeder, but with a few adjustments, this feeder would be quite popular with the cardinals we have. Thanks for sharing your project. Pinned to my bird and garden board!